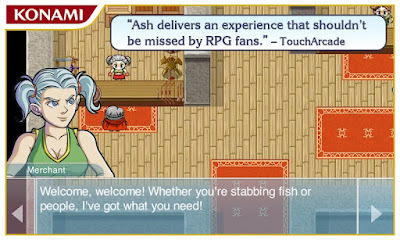 Designed especially for RPG fans all over the world, Ash is a classic turn-based RPG that brings players back to the Golden Age of Role Playing Games. Set in the beautifully realized world of Aghaus, Ash’s intuitive interface, wonderfully orchestrated score, and compellingly epic story will capture your imagination. • Breath-taking classic turn-based RPG action! • Lush visuals captured by brilliant 16-Bit style graphics! • A wonderfully compelling story unveiled through an epic adventure! • Intuitive touch-based interface for easy to use and responsive controls! Ash tells the story of two mercenaries on the fringes of the Empire of Aghaus, a once-great kingdom now fallen into ruin after the death of its king five years prior. When a routine contract takes an unexpected turn, the two men are gradually embroiled in a conflict that consumes the entire continent—and brings to light the mercenaries’ puzzling pasts. What mysteries will you uncover? What legendary tales will you unfold? Dive into the world of Aghaus and download Ash today! 0 Komentar untuk "Ash v1.0.1 Apk"